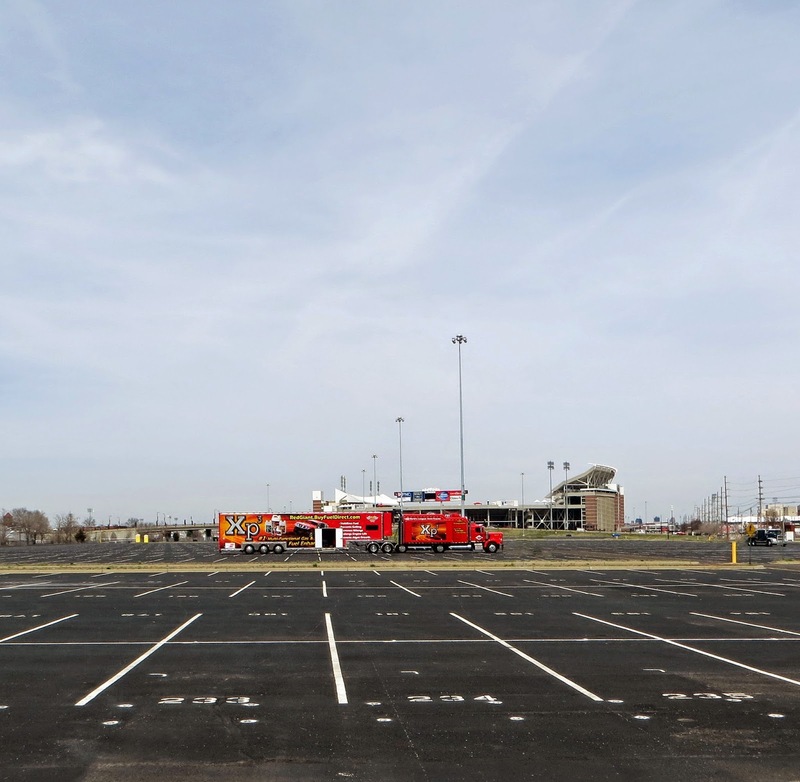 We're still in Louisville, Kentucky, two days after the Mid-America Truck Show ended, and there are only three lone stragglers left in the Papa John's stadium parking lot - us, Marlaina and MacGyver, and the Red Giant. A few days ago this place was PACKED. If you were in a big rig and you came late in the weekend, you'd have a pretty hard time getting into the lot. Even driving around in the rental car was challenging with all the people, golf carts and bobtails tooling around. But today, the Red Giant and the stadium in the background were the only recognizable objects on the horizon. Earlier in the day the owner of the truck, Bryan Dax, stopped over to talk to Ed. I got in on the conversation and wrangled an invite to see the inside of the truck. He said, "C'mon over!" After lunch, we did just that - took the trek across the parking lot to get an up-close look at this beast. 93 feet long and weighing 75,000 pounds empty, this 1990 Diamond Reo isn't hauling freight around the country. The first time we saw this truck, the people who paid to use it for advertising wouldn't let anyone inside, so although we peeked in we didn't really get a great look. Now I was getting my own personal tour. Well...me, Ed, Marlaina and MacGyver. 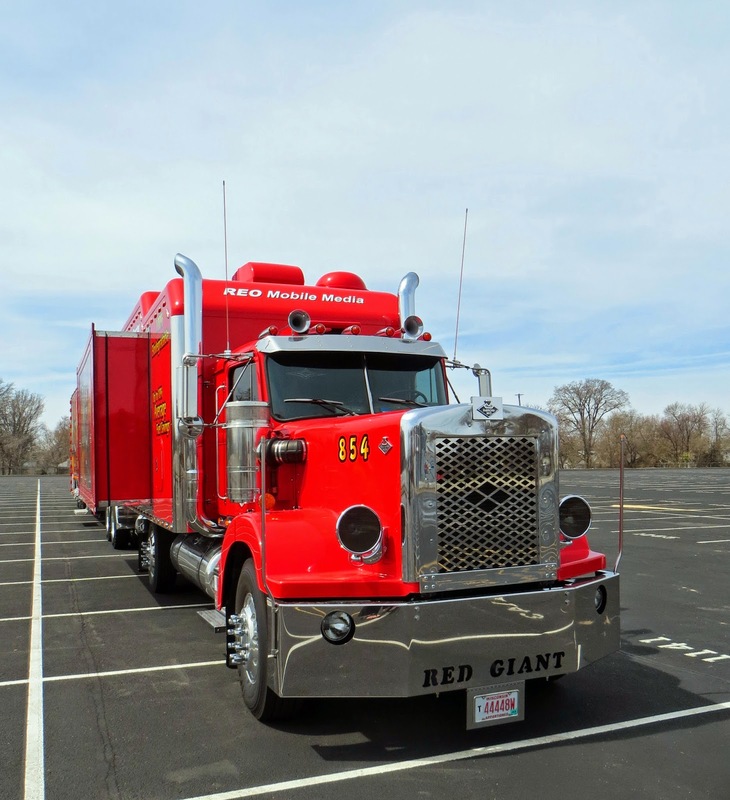 The sleeper itself is 252 inches long (to non-truckers, that's 21 feet!) and has two 16 foot slide-outs which make the interior extremely roomy. And if you notice, it has an extra steer axle under the sleeper itself to carry the extra weight. Each slide-out has an LED screen measuring eleven feet wide by six feet high. The trailer - in the area where you can see the door open - has its own living area in the front part. On this trip, that's where Bryan was staying since he was nice enough to allow the assistant who was traveling with him to stay in the sleeper of the truck. Boy, she got the sweet end of that deal! The owner, Bryan Dax, was extremely friendly, and shared a lot of information about how he came to the decision to own this size vehicle. Basically what he said was, that after 30 years of driving and not really being appreciated for all the miles he was putting in, he decided to figure out a way to get paid while sitting instead of getting paid for moving. The interior is SPACIOUS. I was only permitted to take one photo of the interior and this is what I got. Taken from the corner of the back door looking toward the front of the sleeper, you can see the "office" side of the sleeper. Marlaina is sitting at the dinette table in the slide-out portion of the truck. This side has what I want in my sleeper - a separate desk area in addition to the dinette table. Directly opposite is the bed and refrigerator. Toward the front on the left is the stove/kitchen counter area, and on the right is the bathroom/shower. Marlaina said it was as big as her first NYC apartment! It had tons of cabinet storage, and with the two sides slid out, it truly felt worth of the "giant" part of its moniker. 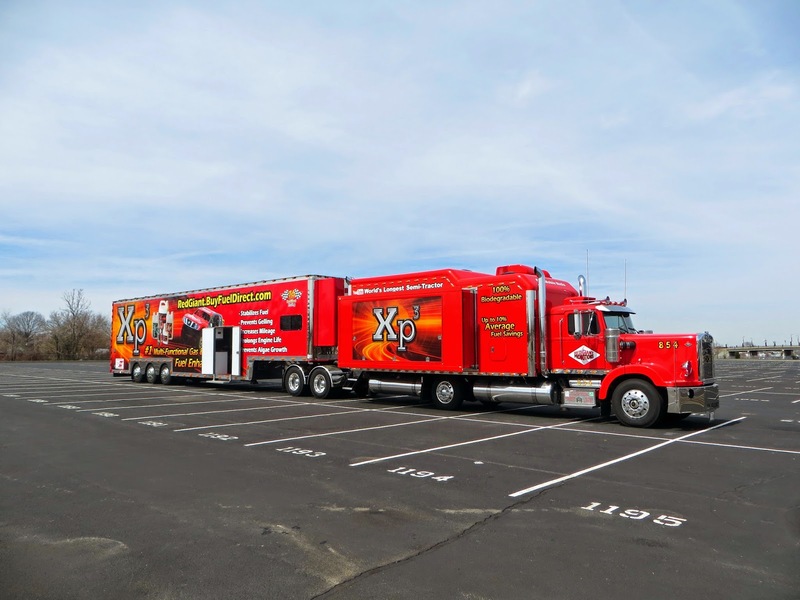 The truck has been seen at hundreds of events - everything from truck shows like MATS, to sporting events, concerts, parties - and in 2010 took Ice Road Trucker Alex Debogorski from New York to California for his "King of the Road" cross-country book tour. This is mobile marketing at its finest, and the truck itself is something real truckers love to see. Diamond Reo isn't a truck you see much of anymore as they stopped making them almost twenty years ago, and the company is no longer in business. Diamond Reo was a division of White Motor Company, which is also defunct. The truck and the mobile advertising concept is a great idea. I might have just found a way to eventually retire yet still stay on the road. Perhaps AARP needs someone to drive around and visit all of the senior resort communities in the country? I'm going to put their number on my speed dial right now. Here's more on Bryan Dax and his fantastic rig, courtesy of 10-4 Magazine.